Good morning sweet friends. Have I got a treat for you today. 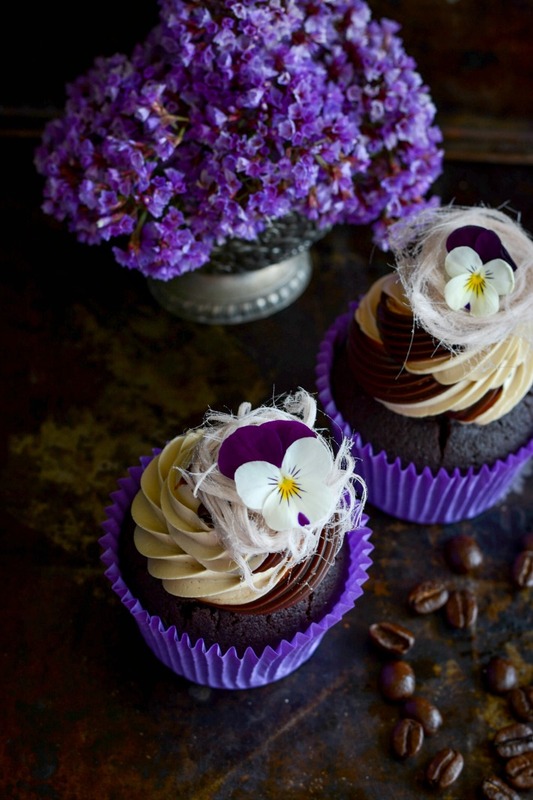 These cupcakes are so delicious, the first mouthful will stop you in your tracks. More of an experience really, not just a mere piece of cake. 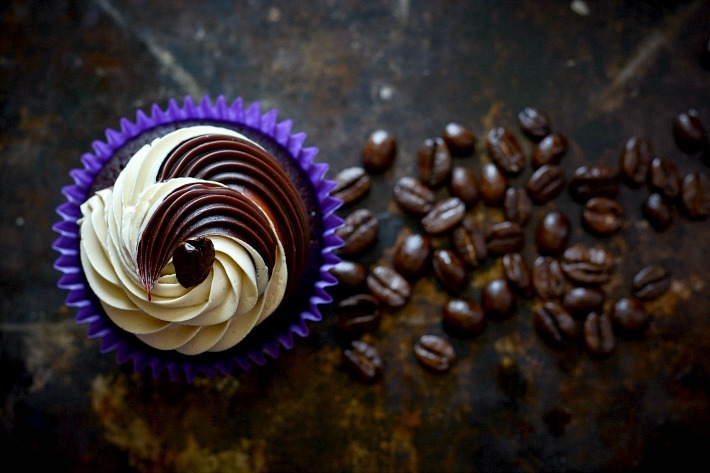 A velvety chocolate cupcake topped with a swirl of silky smooth coffee swiss meringue buttercream and expresso ganache. Well and truly a next level cupcake. Not that I’m actually a coffee drinker. On the contrary, I am a tea girl through and through. 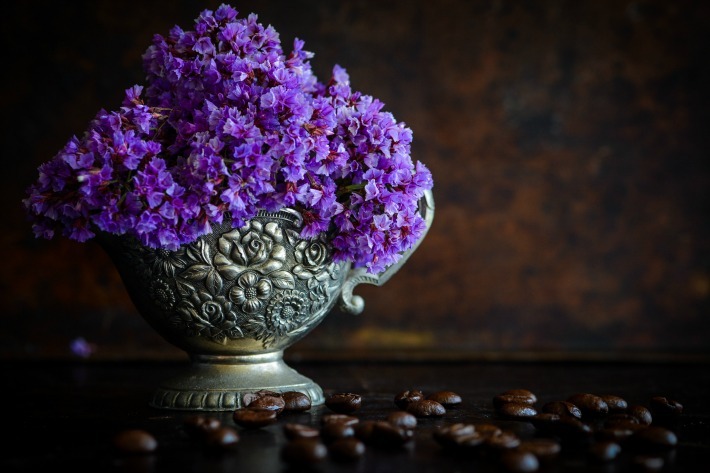 You will never see me with a hot cup of coffee in my hand, despite its intoxicating fragrance. Doesn’t it just smell so good!? 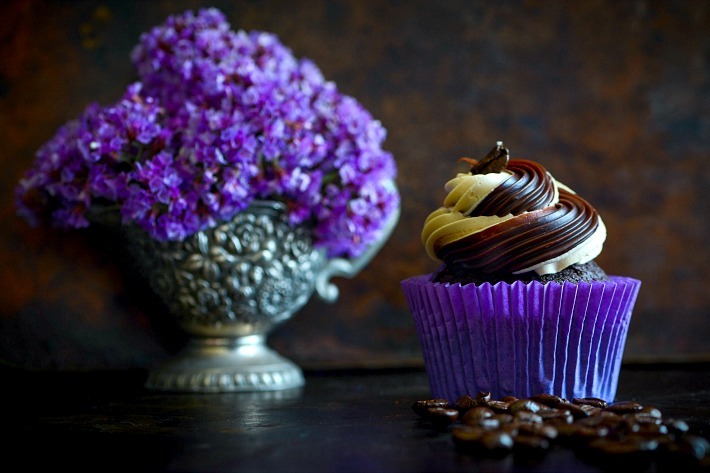 For those of you who, like me, who aren’t die hard caffeine addicts, never fear, you will still love these cupcakes. 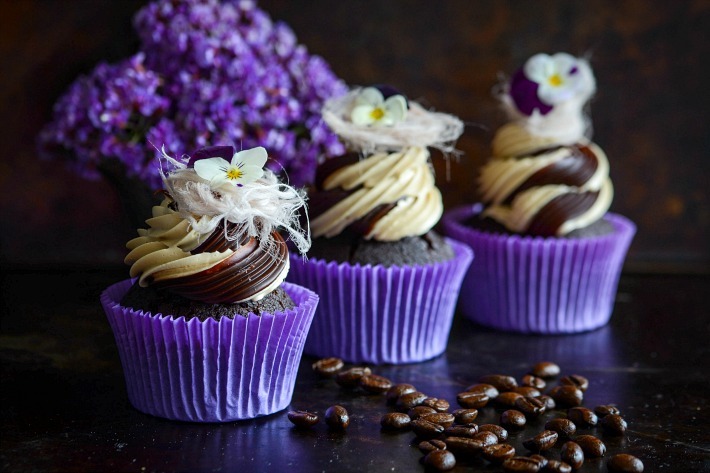 While there is a definite strong coffee presence, the chocolate flavour balances everything perfectly. You may observe that this isn’t a very Spring inspired cupcake flavour. Truth be told, I suspect I am still in denial that Winter is over. I have a handful of wintery recipes I am clinging to in the hope that they will keep the warm weather at bay. A vain hope I know, but never mind, I shall file them away until next year and front up next week with a more season appropriate cupcake combo, I promise. In the meantime, take these as an nod to our American friends who are entering those glorious cooler months. 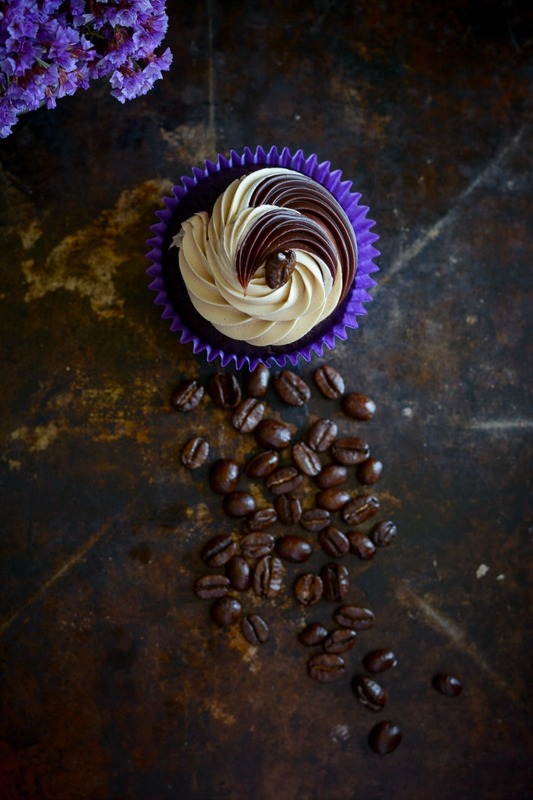 Don’t be daunted by the two toned swirly icing. It’s a fairly simple technique. All you need to do is partially fill one disposable icing bag with the swiss meringue buttercream, and another with the ganache. Don’t overfill or put any tips in the bags, just snip about 1cm off the end of each bag. Line the two bags up together and put them into a third bag with a large star tip in it. Make sure both ends fit neatly into the large nozzle and pipe away baby till your heart’s content. Oh and one more thing, keep cupcakes out of the fridge. You want to eat these beauties at room temperature for the full melt in your mouth experience. 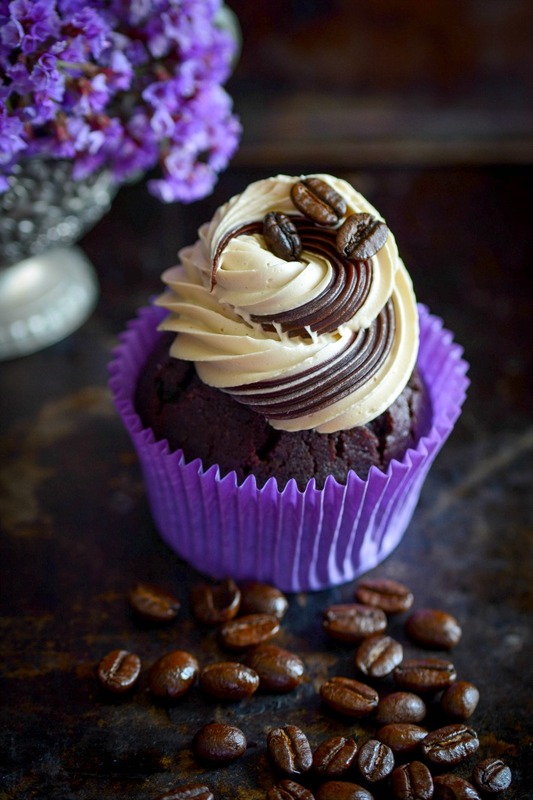 A moist chocolate cupcake with silky smooth coffee swiss meringue buttercream and expresso ganache. 1/2 cup milk, extra You may need up to half cup extra milk if mixture is too thick. Add a little at a time to get desired consistency. Line two muffin trays with 18 cupcake papers. In a medium bowl, using a hand whisk, mix together eggs, oil, vanilla and sour cream until well combined. In a separate bowl, sift together flour, baking powder, bicarb soda and sugar. Add cocoa powder and whisk together until well combined. If mixture looks too thick, add extra milk a little at a time until smooth, but not runny. Scoop into prepared cupcake liners until each is a third full. Bake in a moderate oven for 18 - 20 minutes or until firm to touch and a skewer comes out clean. 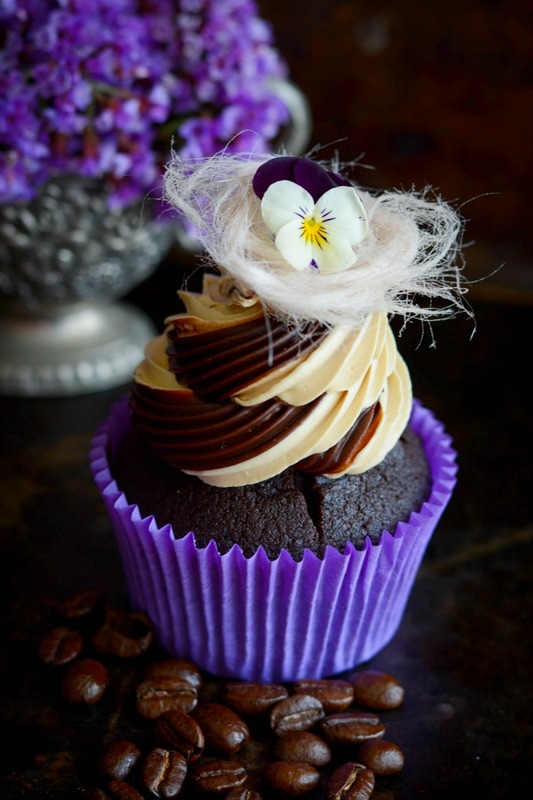 Frost with coffee swiss meringue buttercream and expresso ganache. Read through instructions first and have all ingredients at ready at room temperature. In the bowl of an electric mixer, whisk together 6 egg whites and 1 1/4 cups castor (granulated) sugar. Put bowl carefully onto a small saucepan with 1 inch simmering water in it (a double boiler). Whisk until well combined. Leave for about 5 - 8 minutes or until sugar is dissolved. Check this by carefully rubbing a stream of mixture between your fingers. It should not be too hot to touch. Take bowl off heat and put into electric stand mixer. Using a whisk attachment, whisk on high until meringue with stiff peaks is formed. This may take around 5 minutes. Change to paddle attachment and mix on low. Add 1 1/4 cups chopped butter, at room temperature, a little at a time. Keep mixing for about ten minutes or until mixture gets soupy, then a little curdled, before magically turning into silky smooth buttercream. 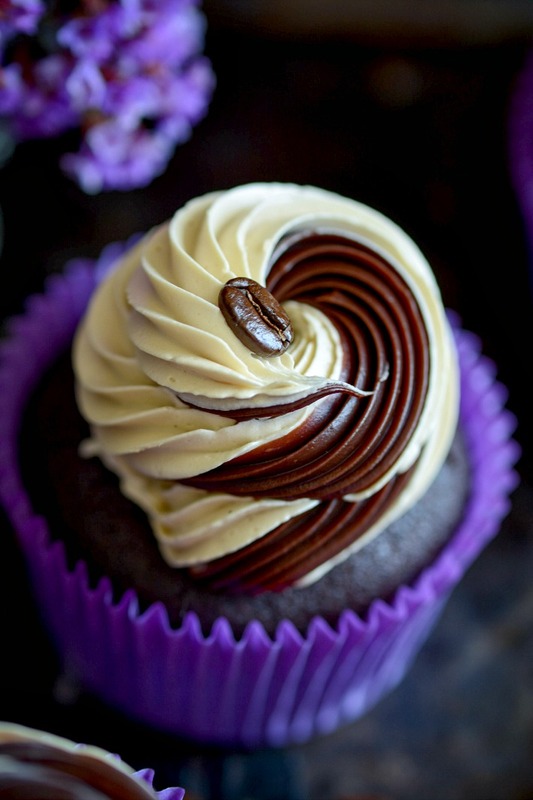 Slowly pour 1/4 cup strong coffee into buttercream, while keeping the mixer on low. Mix until coffee is absorbed into buttercream. Finely chop 200g block of dark chocolate. Put into a heat proof bowl. In a small saucepan, gently heat 1/2 cup cream. Add 1 tablespoon instant coffee powder to simmering cream. Stir until dissolved. Continue to simmer until quite hot, (but not bubbling) stirring occasionally. Carefully pour cream over chocolate. Leave for about a minute before stirring carefully until smooth. Leave ganache to cool and thicken until it is about the same consistency of peanut butter. It needs to be thick enough to pipe onto cupcakes. Put ganache and swiss meringue buttercream into separate piping bags without icing tips. Cut 1 cm off the tips of each bag. (Don't overfill bags) Place two bags into a third bag fitted with a large star tip. Make sure the ends of both bags fit inside the star tip. Squeeze frosting until both ganache and buttercream come through in a nice streak. 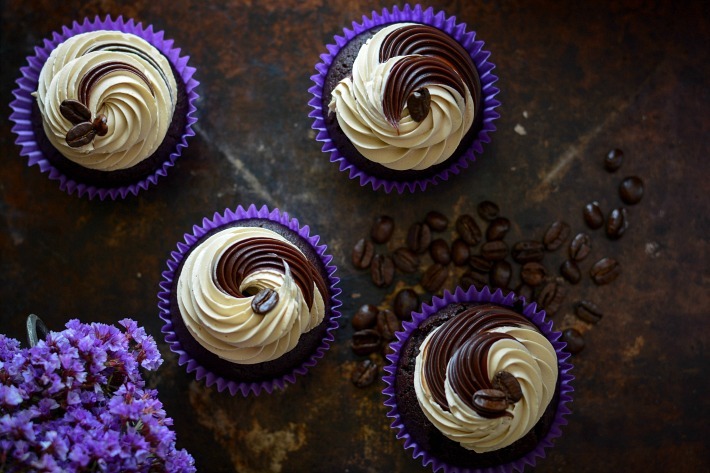 Frost cupcakes with a swirl. 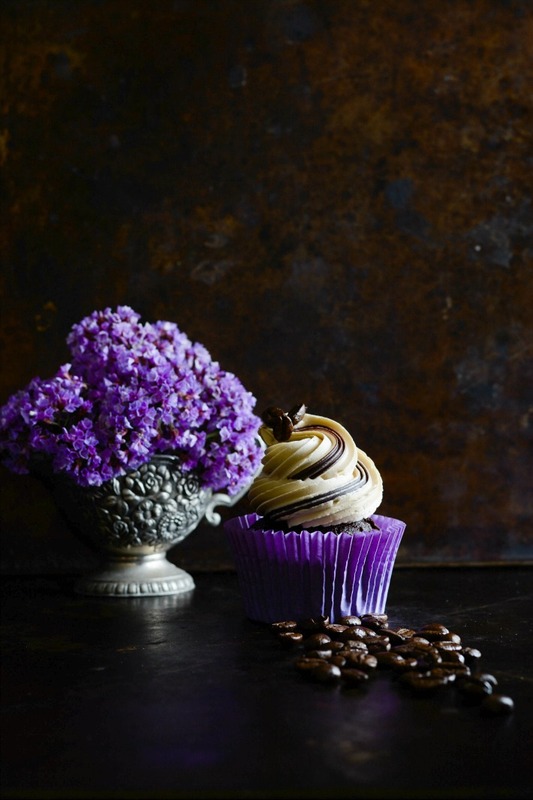 Loving your photos Anna, you are certainly developing your creative photographic skills to be as delicious looking as the cakes you’re baking!